The League launches Centennial Celebration Week on the north coast with the Stand for the Redwoods Festival in Humboldt County at the Orick Mill site in Orick, California on Sunday, October 7 from 12:00 p.m. to 5:00 p.m. and ends with the capstone event, the Stand for the Redwoods Festival in San Francisco on Sunday, October 14 from 12:30 p.m. to 4:30 p.m. at Yerba Buena Gardens in San Francisco, California. Sign up for the League’s mailing list to receive the latest updates about centennial events. An Oregon native leaves home at 18, follows love from Alaska to Louisiana only to learn about heartbreak the hard way, meets his birth mother for the first time, eventually settles in Hawaii, and launches a successful band. It isn’t the fulfillment of some loose end in Easy Rider or Five Easy Pieces though. 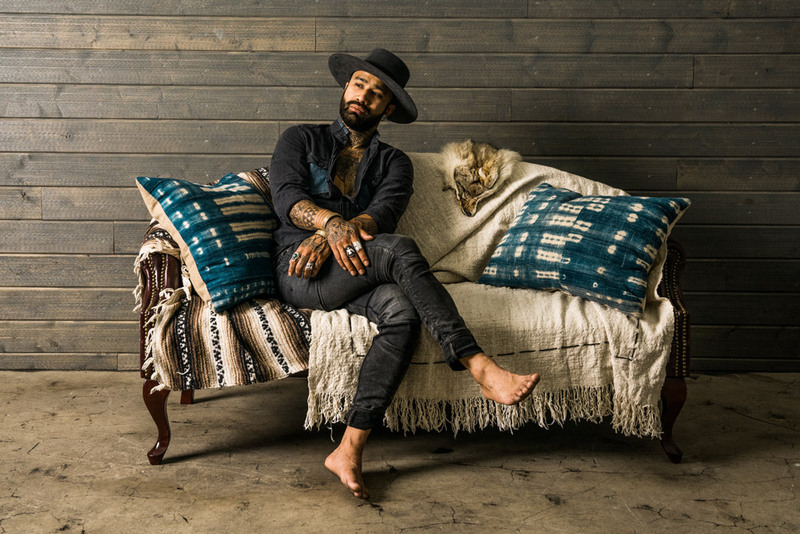 It’s the origin story of Nahko captured on his 2017 solo offering, My Name Is Bear. The album predates his rise to mythos among diehard fans in Nahko and Medicine for the People, and it’s an important piece of the puzzle that is Nahko. My Name Is Bear might incite some of the same questions. Artfully merging rustic acoustic guitars, upbeat energy, tribal flavors, fiery percussion, and ponderous lyrics, these recordings reflect the soul and spirit fans have come to know and love from his work in Medicine for the People, while venturing into decidedly more “rocking” and “personal” territory, as he puts it. Whether singing on a grand stage, speaking to an eager crowd, or authoring stories through lyric, melody, and beyond, Saeeda “Mama Sae” Wright is sure to elevate your mind and your spirit to heights you didn’t know you could reach. Her passion is electrifying, and her voice so magnetic you cannot help but find yourself enveloped in the stories Saeeda is telling. You will be captivated by more than just what you hear coming from Saeeda when she takes the stage, you will feel loved, inspired, and encouraged all at the same time. These are the gifts Saeeda has been cultivating since she was child. Surrounded by praise and worship ministers, it was in her blood to find her voice and tend to its blossom throughout her life, including furthering her education as a Voice Major at Clark Atlanta University. Currently Saeeda can be seen on stages backing Prince, is a member of his New Power Generation, and is featured with the Tim Snider Trio. Over the last Twenty years Saeeda has had the privilege of working with artists such as Lalah Hathaway, Mike Phillips, Patrick Lamb, Duffy Bishop, and The Pacific Northwests own Liv Warfield. Saeeda has also been blessed to grace the stage with or open for Gospel Music Power-houses Jessica Reedy, Cece Winans, Crystal Akin, JJ Harrison and Yvette Williams of the Kurt Carr Singers. Some of Saeeda’s studio credits include Prince, Derrick McDuffey and Kingdom Sound, Liv Warfield, Patrick Lamb and Bruthaz Grimm. She is very well known and respected for her work as a soloist with the Oregon Symphony, and has been a regular participant in Portland’s Annual Blues Festival, as well as many other festivals and events that take place in Oregon annually. Along with performing, Saeeda is a dedicated vocal coach, helping other aspiring vocalists reach their full potential. Besides the gifting and incredible work ethic put forth from this powerful woman, her dedication to her family, her faith, and giving back to her community remain her biggest priority. She embodies humility, grace, and generosity, making her an asset to every environment. Jazz Mafia’s Heaviest Feather (HF) formed in 2017, performing that very summer at high profile festivals including Oregon Eclipse/Symbiosis. The air tight eight-piece band brings together the Bay Area’s brightest rising stars alongside its most seasoned professionals. HF regularly presents fully customized shows featuring original and new music, and a who’s who of Bay Area vocalists, from all genres. HF also serves as the house band for the bi-monthly Sunday Skool series, a collaboration with esteemed circus-arts posse Vau De Vire Society. The distinct sound of HF is rooted in its five brass instruments, mixing those organic sounds with heavy EDM, hip hop, rock and world music. Soulful vocals are often added on top, and it all comes together to create something fresh, eclectic, and genre-defying. Each member of HV is an established and innovative writer/arranger, and each voice fuels the eclectic diversity that shines through in a typical HF set. Keeping up with who’s playing what instrument at any given time can be a dizzying experience, as many of the members bounce between two to four instruments in a set, as well as singing lead vocals. Heaviest Feather recently premiered its “Tribute to the Ladies of Hip Hop” in January of 2018 in Jazz Mafia’s monthly Live Mixtape series. The two-hour live show features five deadly female lyricists performing HV’s arrangements of their original music, as well as non-stop medleys and mash-ups of dozens of classic hip hop jams from the female lexicon. John Evans is one of the night-time anchors on All News 106.9 FM and AM 740 KCBS. He keeps listeners informed from 10 p.m. to midnight and 2 to 5 a.m. John’s a 40-year Bay Area radio personality, having been an integral part of many legendary stations including Classical KDFC, Smooth Jazz KKSF, World Class Rock KFOG, K-101, and 610 KFRC. This FREE, family-friendly music festival offers amazing live music all afternoon in downtown San Francisco, face-painting for all ages (want to look like a flying squirrel? ), and… wait for it… dancing redwood trees! Our Centennial partners will also have engaging activities at their booths for all ages. Our partner Sierra Nevada Brewery will be providing a beer garden. People from the San Francisco Bay Area and beyond will gather to celebrate 100 years of redwoods conservation and take a stand for their future, all the while dancing across beautiful Yerba Buena Gardens. This is a totally free event, so grab your family and friends and join us! RSVP for the event on the League’s Facebook page — be sure to invite your friends! Children of the forest unite! Help us celebrate our birthday party by joining in A Creatures of the Redwoods Puppet parade! We will meet up at the Dancing Redwood Tree puppet near the face painting area then move out for a short parade through the crowd. You will get to choose from a hand held salmon puppet, California red legged frog mask, or butterfly wings! First come, first pick of the puppets, masks and wings. Supplies are limited but all children are welcome in the parade. Beer will be available for purchase at a beer garden sponsored by the Sierra Nevada Brewery. Must be 21 yrs or older with a Valid ID to purchase alcohol. Food is available for purchase by vendors in the surrounding area. For more information about dining options, visit the Yerba Bueana Gardens website. The festival will be held at Yerba Buena Gardens, located at 750 Howard St, San Francisco, CA 94103. Yerba Buena Gardens is a short walk from the BART | MUNI Powell + Montgomery Street stations. This is a Bartable event! The CalTrain Station at Fourth and Townsend is served directly by MUNI with stops on Third Street at Howard and at Mission. Yerba Buena Gardens is also convenient to Golden Gate Transit, SamTrans, AC Transit, Taxi, Uber + Lyft. Parking garages and street parking are available nearby. For more information about getting to Yerba Buena Gardens, visit https://yerbabuenagardens.com/visitor-information/. Please leave behind any of the following: Weapons of any kind, fireworks/explosives, illegal substances, large coolers, glass containers, or alcohol. No illegal vending is permitted – no unauthorized/ unlicensed vendors are allowed. No smoking will be allowed on Festival Grounds. Visit the Yerba Buena Gardens website for more information about planning your visit and park rules. No animals are allowed at Yerba Buena Gardens (with the exception of ADA-qualified service animals). Baked-in to any Monophonics record there’s a vfibe, that elusive element that lesser bands can’t fake, as Kelly Finnigan put it: “I think it’s having people who are all on the same page, striving to capture that musical moment and being honest in their playing and being thoughtful and putting their ego to the side to serve the song.” Monophonics is Austin Bohlman (Drums), Ian McDonald (Guitar/Background Vocals), Ryan Scott (Trumpet/Back- ground Vocals/Percussion) & Kelly Finnigan (Keys/Lead Vocals) along with Max Ramey (Bass). The Santa Cruz, California-based quartet’s latest, Stereoscope, out February 9, 2018, marks an evolutionary leap in a journey of artistic identity, songwriting maturity, band friendship and fiery group synergy. Here, Marty O’Reilly & the Old Soul Orchestra homed in on their signature cosmic roots aesthetic, brimming with cinematic songcraft, impressionistic lyrics, clever arrangements, telepathic ensemble interplay, and soulfully world-weary vocals. SARITAH (sa-REE-ta) is on a worldwide musical mission to uplift, inspire and heal. Bursting with an organic sound that is a uniquely feminine blend of reggae, roots, soul and acoustic flavours, Saritah has a relentless passion for reawakening truths, contributing to the worldwide raising of consciousness, and inspiring people to live their purpose and follow their dreams. Her latest single HERE WE STAND, released Nov. 22 2017, is an anthem for Mother Earth, a plea and a chant to action for people worldwide to stand up today and protect the only home we have. Produced by Mista Savona (‘Havana meets Kingston’), HERE WE STAND is a response to the current onslaught of pollution and destruction that big business is inflicting on land and water across the planet, and the indigenous-led worldwide movement to protect what precious life is left. The video, filmed and edited in Aotearoa (New Zealand), featured on reggaeville.com and has received a great deal of positive attention from across the world. Born in Seoul, South Korea, raised in Perth, Australia, and currently based in California, Saritah calls the world home. Inspired by the beauty of the planet we live on, as well the overwhelming realities that face humanity on a day-to-day basis, her songs are celebrations, revelations, invocations, affirmations. Equally at home fronting a full band on the big stage with an audience of thousands as she is with an acoustic guitar in front of an intimate crowd, Saritah has a positive vision for the future that shines through every word she sings and every note she plays. Playfully powerful, she has become a festival favourite with her infectious, beaming smile and colourful, energetic live shows. Saritah has graced the stages of some of the world’s most renowned musical gatherings and stages. Johanna Nagan is the owner of Blondies Food and Drink in Arcata, California, co-founder of the Mr. Humboldt Pageant and cat herder—AKA the mother of two young children. This FREE, family-friendly music festival will take place right next to Redwood National and State Parks, home of the world’s tallest forest. This fantastic event will celebrate the League’s 100th and Redwood National Park’s 50th anniversaries. It offers great live music, a variety of children’s activities, local vendors and an assortment of other interactive programs provided by our Centennial partners. This is a totally free event, so grab your family and friends and join us!